Utagawa Kunisada/Toyokuni III (1786-1865) and Hiroshige II (1842-1894) Miracle Stories of Kannon, Temple no 10: The Miraculous Story of the Goddess of Mercy, 1858. Oban. What an astonishing design this is; the crabs and the dress of the standing figure are a tour de force of graphic invention. The upper temple-complex at Mimurodo in the upper part of the print is designed by Hiroshige II, the lower scene is by Kunisada. The print is from a series of over sixty scenes of pilgrimage places of the goddess Kannon, an Indian Buddhist deity revered in Japan since the sixth century. A pious peasant girl, pictured left, was taught the mercy of the goddess Kannon, once rescuing some crabs from a local fisherman. One day her father, in jest, offered his daughter to a snake in the field. The snake returned in human form to claim the girl who begged for mercy and recited the Kannon sutra. 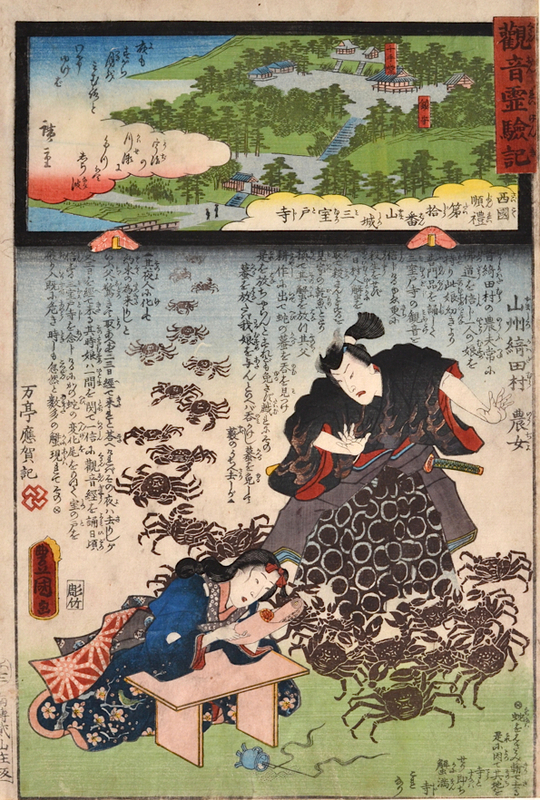 At that moment, an army of crabs appeared and cut the snake down. The print is a particular favourite of the gallery and we use part of it as the masthead on our wordpress blog. A very fine print, Untrimmed with full margins and good colour. A strong impression with some yellowing; some wear. Overall very good.